The U-M School of Nursing academic environment is a staging ground for nursing leaders in current and changing health care systems. Critical study of theory, cutting-edge curriculum, state-of-the-art technology, authorship of research, advanced clinical practice, and mentored leadership in complex organizations are all part of a UMSN education. Our degree programs are structured as pathways to careers in advanced clinical practice, leadership in health care organizations, informatics and population health, and research. U-M School of Nursing graduate degree programs are structured for careers in advanced clinical practice, research, leadership in health care organizations, informatics and population health. Building a meaningful graduate degree program for you starts now. View our graduate degree programs. DNP-prepared nurses are able to: provide advanced clinical care, lead interdisciplinary teams of health professionals, translate research findings into clinical practice norms, and manage complex health care systems. MSN prepared nurses lead in a variety of complex organizations and environments to improve health outcomes. Focus areas are leadership; health informatics; and population health. Post-master's DNP graduates translate evidence into practice in settings such as health systems, communities, and primary care. Graduates lead changes in health care delivery and public policy. Learn about recent DNP graduates' projects. Ph.D.-prepared nurses are able to: conduct basic science, study the physiological, psychological, and socio-cultural aspects of health, inform and advise on nursing practice and policy, and contribute to the further development of nursing theory. Learn about current Ph.D. students and recent graduates. BSN-prepared nurses are able to provide superb bedside care, work in teams with physicians and other health professionals, provide health education, and implement health and safety policies and procedures. Undergraduate and graduate students can add a concentration to their degree program. We offer concentrations in global health and occupational health nursing. This concentration is offered to students in any master's or DNP program. The global health concentration is designed to educate students about global health issues and provide an opportunity for practical field experience. The concentration promotes multidisciplinary prevention over treatment and community-based service over institutional care. Requirements are to complete two additional classes and a substantive overseas internship or service. Serving in the Peace Corps may fulfill this overseas requirement. For more information, speak to the global affairs advisor or an academic advisor. This concentration is offered to students in the adult-gerontology primary care nurse practitioner MSN, primary care family nurse practitioner MSN, and systems, populations and leadership MSN - population health emphasis. Occupational health nurses help to maximize workers’ health and productivity, reducing illnesses and injuries while controlling costs. It is a challenging and rewarding profession with multiple career options in clinical practice, health services administration, higher education, and research. Occupational health nurses are employed by businesses, industry, government agencies, hospitals, clinics, their own businesses, as well as colleges and universities. The occupational health nursing concentration is part of the University of Michigan Center for Occupational Health and Safety Engineering (COHSE). Traineeships in the form of tuition support and stipends are available to eligible students through COHSE, which is funded by the National Institute for Occupational Safety and Health. Speak to the faculty director, Dr. Marjorie McCullagh or an academic advisor for more information. To apply, submit a concentration election form to Admissions & Records. Once accepted, a faculty advisor will help determining the sequencing of concentration coursework. The concentration requires 15 credits in addition to all required courses. These credit hours include interdisciplinary occupational health and public health courses, such a occupational and environmental health, occupational diseases, ergonomics, and safety. With the growing demand for focused, specialized knowledge, a certificate can be an important way for health care professionals to increase their qualifications. Certificates are intended to supplement rather than replace an academic degree. Both nurses and non-nurses can earn UMSN's certificate in health informatics with completion of just 16 credits in a web-blended curriculum, which prepares students to sit for a variety of informatics certifications. This course provides participants with the beginning knowledge and skills to complete an improvement in practice that is informed by evidence. Designed for nurses (RNs) working in any setting, this course is guided by principles of adult learning and uses on line learning strategies. The learner does not need to have baseline knowledge of EBP rather they need to have the desire to learn. The course is a combination of synchronous and asynchronous teaching approaches that provides the systematic steps of evidence-based practice to improve quality of care. This is a “hands on” course and learners will be guided through exercises designed to provide real world experience in evidence-based practice. The learners will gain knowledge and skills in posing clinical questions amenable to EBP, search strategies to locate evidence, critique and synthesis of various types of evidence, action plan development and execution, implementation and evaluation an EB clinical practice change, and dissemination of the project findings. The learner will achieve a certificate in EBP and earn 80 CEs. This certificate is designed for individuals who seek to enhance their teaching skills and techniques in relation to the field of nursing. The certificate in nursing education is only available to those who have already completed a master's or doctoral program as well as students currently enrolled in a master's or doctoral program at UMSN. These certificates are designed for individuals who have already completed a master's or doctoral program as well as students currently enrolled in a master's or doctoral program at UMSN. The advanced practice certificate provides additional advanced practice skills in leading and managing health in a different focus area than the original master's degree. Options include: adult-gerontology acute care NP; adult-gerontology CNS; acute care pediatric NP; adult-gerontology primary care NP; primary care family NP; nurse midwife; and primary care pediatric NP. The mini-certificate will be awarded to students (undergraduate and graduate) who complete all three one-credit mini-courses (HS540/541/542). Each course meets only once, for a full-day Saturday interactive workshop. Requirements include pre-learnings, debriefing, and a post-workshop reflective essay. Learn more about the course content and schedule. See our complete accreditation information. 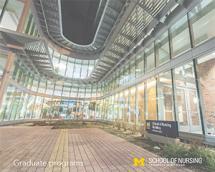 The University of Michigan School of Nursing has more than 600 site locations for you to fulfill your clinical requirements, from top-ranked health systems to small rural clinics and specialty locations. We have partnerships with nearly every health system in the state of Michigan and a growing number of additional locations throughout the country. We are continually working to add new sites in order to give our students more opportunities. Learn more about clinical learning opportunities at UMSN.